Go to the preview of Coles Catalogue 17 – 23 Apr 2019 to see what the deals are for this week. This is one of the largest supermarkets in Australia. This page aims to post about whatever the information we collect about hot deals from the retailer. OCCASIONAL SALES LIKE CHRISTMAS, EASTER and so on. 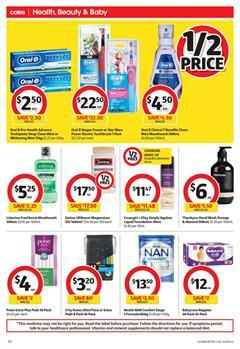 Coles is one of few supermarket retailers that we love to review and browse its weekly specials or weekly catalogues. Moreover than these scroll down to read some of the latest reviews of our authors. Your attention may be drawn by one of those posts. Our posts generally aim to lead every visitor to the best deal, however you can also find authors who share their experiences with the product that they purchased from Coles. Coles Easter sale is not only about the candies or treats. You can see a lot of products of health care, baby, personal care, household supplies, chemicals, cat and dog foods, and more products. Coles Catalogue is currently one of the most popular Easter catalogues. Buy Oral B clinical 7 benefits clean mint mouthwash for only $4.50! Half-price deals are effective starting on Wednesday. You have Herbal Essences bio renew at half price. Care about your hair and be careful about the damages when the season changes. You might want a different look in the new season. L'Oreal Excellence hair colour 1 pack is gonna cost $10 ea. Get your chemical cleaning products at Coles supermarket. Coles household sale covers a half-price for Dynamo, Cold Power, Finish Dishwasher, and more items that are at half prices. The cost of Comfort fabric softener, which I think is essential, is only $3.50. Also, buy some treats and foods for your dog or cat. Supercoat dry dog foods, Dine daily cat food, grain free, nature's gift deli roll dog food, and more are available there. Browse the details of Coles Catalogue grocery sale with special deals of Easter. Firstly, if you want to see an extensive catalogue range of Easter treats or traditional foods, check out Coles Catalogue Easter sale. A lot of half prices are available in fridge foods and packaged-food products. For example, buy Nice & Natural nut bars at half price. Vege chips original 100g is gonna cost only $1.90! Save half on that product. Stock up pantry products when these products are available for the catalogue prices next week. Weet-bix blends multi-grain, Heritage Mill clusters or Muesli, LeSnak, and more items from the pantry range are on sale. Save $4.40 on Capilano pure honey value pack of 1.5kg. Shop dairy products like Greek yoghurt, Berri Australian grown orange juice, Oak Flavoured milk, Bega cheese block are in the dairy range. Coles also offers cage-free eggs. Pace Farm liberty cage-free eggs 12 pack costs $4 next week. Snacks and drinks range is full of half-price deals. Toblerone milk chocolate 360g costs $4.95 with that half-price discount. You have great deals on chocolate boxes and candy treat packs. Find soft beverages including Schweppes. Schweppes mixers or Pepsi Max 4x300mL pack will cost only $2.90! You have also frozen foods including ice cream. Reese's or Hershey's tub and Mr Chen's Prawn Hargow are both half-price deals. Find packaged-foods and buy them at half prices. Steggles chicken breast tenders will be $3.90 which half-price saving. Go to pg 28-29 for these offers and Cornetto ice cream. Coles opening hours in Easter can change. All Coles stores will be closed on Good Friday and they will reopen on Easter Saturday and Monday. Only some stores are operating on Easter Sunday. You can use this Coles Catalogue to save on some Easter treats and festive foods. Tradition meets the modern type of retailing of Coles. One of the traditional products is hot cross buns of 6 pack which will cost only 2/$6! Buy deli, breakfast foods, beverage, and party foods on pg 2-3. Coles sells cheese & garlic full apart for only $4! 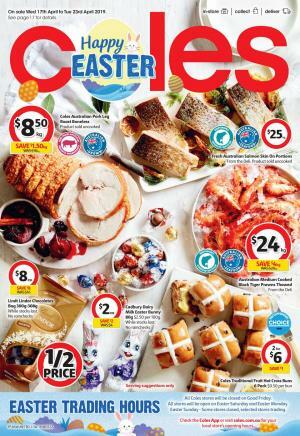 Seafood for Easter is one of the sales at Coles stores and catalogue. Get fresh Australian salmon skin off portions at $29/kg. Save $3.50/kg on that product. This week one of the most important catalogues is Coles Catalogue Easter Sale 17 - 23 Apr. Coles offers a great meat range on the catalogue. Australian beef porterhouse steak is one of the classics and it costs $29 starting on Wed. Lamb meat, roast chicken, and more delicious food items are also in the catalogue. Buy Easter candies and chocolate offers on pg 9. A half-price deal will be valid for Mars Maltesers and more confectionery. A new item is also available. Remember to see the next week's prices of Coles fresh produce range. Kanzi apples are only $4.50/kg. One of the Coles specials is from deli & fridge category. Primo chilli coated salami, cacciatore, and more products are available in the latest Coles Catalogue pg 12. Coles RSPCA approved hot roast chicken price is $10/Kg. More than these are available in the Coles Catalogue grocery sale. Browse all the products on the currently browsable pages. Browse the Coles Catalogue Easter Sale 17 - 23 to see all products. Easter chocolate offers, brands like Cadbury, Maltesers, and more are available in the catalogue.